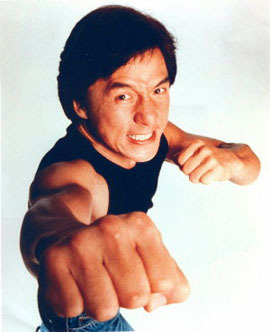 Jackie Chan is a martial arts film star, often billed as an action star who did his own stunts. For most of his career, Chan performed most of the non-routine stunts in his films, and planned, tested, choreographed, and performed the elaborate, jaw-dropping "wow" fights and jumps that made his films visually spectacular. But nobody outruns time, and in 2012, when Chan was 58 years old, he announced that he would not continue climbing clock towers, kickfighting atop speeding trains, or shimmying up light poles, and that his future action movies would see stuntmen doing more of the stunts. Chan's parents were staff workers at the French embassy in Hong Kong; his father was a cook, his mother a maid. He was mostly raised at a boarding school, where academics and performing were both stressed, along with rigorous physical training. With young Chan's athletic and dramatic skills, he was a minor child actor in Hong Kong movies in the 1960s, and he worked as a stuntman and extra on Bruce Lee's 1973 kung fu classic Enter the Dragon. Throughout the 70s, Chan worked as an actor and stuntman on innumerable Hong Kong films. He had been in at least 50 films before his star-making role in 1978's Drunken Master, with comedy that comes through even in subtitles, and fight scenes that are astonishing. With Drunken Master, Chan found the movie persona that worked perfectly for him. His characters are usually slackers or wisecrackers, maybe not too bright, but willing to work hard. Chan has said his characters are generally -- and intentionally -- the opposite of Lee's stalwart, morally upright, unbeatable heroes. Chan wanted viewers to feel that his character does not want to fight, not because he is philosophically opposed to violence but because he is afraid he will get pummeled. In the 1980s Chan attempted to export his stardom to America, but his American films (The Big Brawl and The Protector) were duds. Back in Hong Kong, Chan continued making eye-candy: any of his Police Story films are better than Arnold Schwarzenegger's best, and the motorcycle-train-helicopter chase sequence at the end of Police Story III: Supercop is amazing to watch -- and even more amazing when one recalls that Chan and co-star Michelle Khan did their own stunts. Armour of God: Operation Condor puts an Asian spin on Indiana Jones, and Twin Dragons is perhaps his funniest film. Other essentials include Project A II, Thunderbolt, Fearless Hyena, and Snake & Crane Arts of Shaolin.